This post is sponsored by The Quaker Oats Company, all opinions are 100% my own. Did you know that today is National Oatmeal Day? It is! 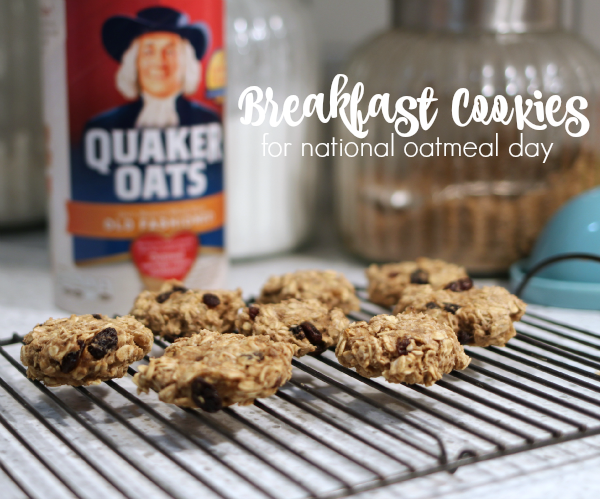 To celebrate, we made some yummy breakfast cookies to celebrate National Oatmeal Day. Psst! They are the perfect on-the-go breakfast treat to nibble on the way to the bus stop. Baking breakfast with kids in the morning is not the easiest. But when it’s a baked treat like these cookies, the kids can help me make it the evening before ”“ it’s perfect. 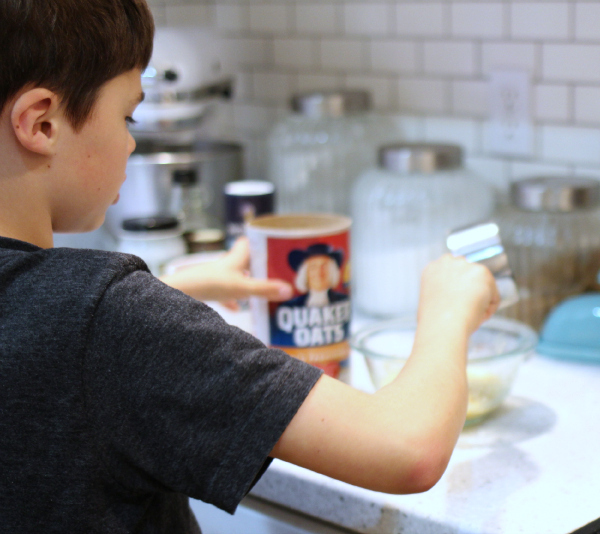 Our usual go-to breakfast is oatmeal for my daughter or Quaker Oatmeal Squares for my son, so can you see why we are celebrating National Oatmeal Day ”“ it is our favorite breakfast! This is why when Quaker asked me to be part of their Oat Authority, it was such an easy yes ”“ it’s already a product we love and use daily. 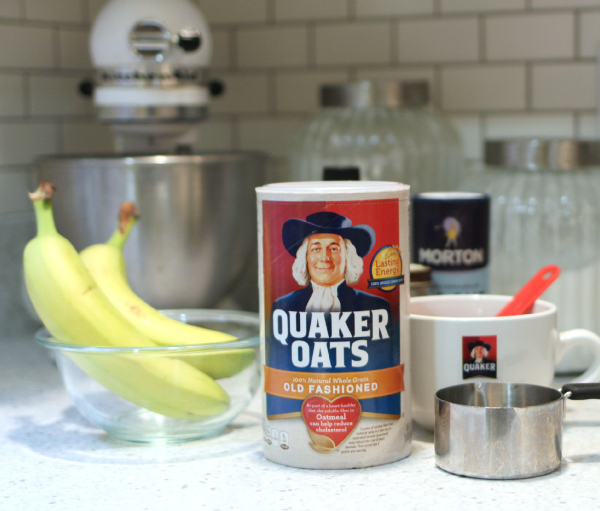 Quaker believes that everyone should begin each morning prepared for the good things that lie ahead. That”™s why on National Oatmeal Day, Quaker is giving away up to one million bowls of oatmeal to help give people across the country the best start to their morning. After the recipe check out the fun giveaway I am hosting for National Oatmeal Day. 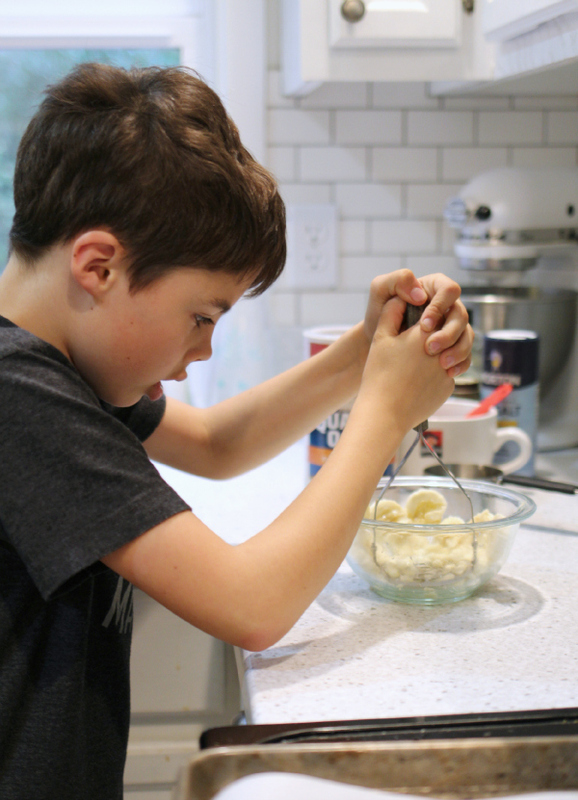 Mash banana – this is my son’s favorite job. 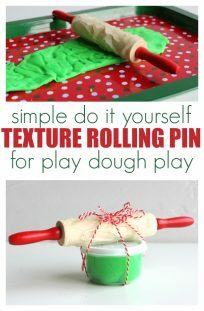 We use a potato masher to make it easier! Add in maple syrup, vanilla, and coconut oil. Add in oats. Let sit for 10-15 minutes. Pop on a cookie sheet and put it in the oven. Our recipe made 10 cookies. Bake for 15-20 minutes. I like them well done and mine were cooked for 20 minutes. I”™m giving away 10 Quaker® Off You Go Moments Kits! Leave a comment telling me how your child likes to eat oatmeal? Giveaway ends November 1, 2015. This giveaway is solely administered by No Time for Flash Cards. This sweepstakes is open to American residents 18 years or older. To be eligible for the sweepstakes you must leave a comment on this post with your name and email . 10 winners will be drawn at random, using Random.org, after the sweepstakes ends on November 3rd 2015, at 8:00pm PST. The winners will receive the kit above valued at approx. $90. After the winners are notified he or she has 48 hours to respond with their mailing address for shipping. No purchase necessary.The number of eligible entries received determines the odds of winning. Any information gathered through the sweepstakes including email and postal addresses will not be used in any way other than contacting winners and shipment of winnings. VOID WHERE PROHIBITED BY LAW. Next Post: Painting with Lollipops – 5 Senses Art! Daily! With raisins and yogurt. My family and I love Quaker oatmeal! It makes getting up and ready for school in the cold, dark winter months here in NH easy peasy. Delicious, quick, yummy and simple. Doesn’t get any better than that! Oatmeal with bananas is a staple in my house! My children (and grandchildren!) love the granola recipes I make using Quaker Oats. It always includes chopped nuts – either pecans and/or walnuts – brown sugar and honey. One daughter and husband munch it watching tv. Another daughter likes it sprinkled on yogurt. My group of five love oatmeal no bakes cookies and an oatmeal breakfast bake!!! My son Casey loves honey and oatmeal and his favorite is when I give him a honey stick and he can drip his honey into a warm bowl of oatmeal – for dinner or breakfast a winner for mum as it is healthy and a winner for Casey because he LOVES it! These prizes sound awesome! I love oatmeal, just made a big batch of steel cut oatmeal fortified with bananas and protein powder yesterday. My two sons always loved their oatmeal in the morning with raisins and brown sugar sprinkled on top. They mostly loved my oatmeal raisin cookies. As a teacher I use oatmeal in my classroom for numerous projects! My son loves his oatmeal with brown sugar and craisin. I like my oatmeal with honey and raisins. My kids love warm oatmeal made with milk and brown sugar, honey and frozen blueberries! My grandson likes to eat his oatmeal with peanut butter in it. I buy plain yogurt and blend in my own frozen fruit into it for sweetness. I found when I do that though, it makes the yogurt very soupy and messy! My brilliant discovery is that if I make it in a big batch and then add oatmeal and chia seeds into the bowl, it thickens up right back to normal. Plus, the yogurt is now padded with an extra whole grain for staying power. We eat oatmeal every morning this way. It is quick, healthy, and easy to scoop right into our bowls before we head off to school. My grandson loves oatmeal with a scoop of almond butter stirred in and blackberries on top! He is 2 1/2 years old. 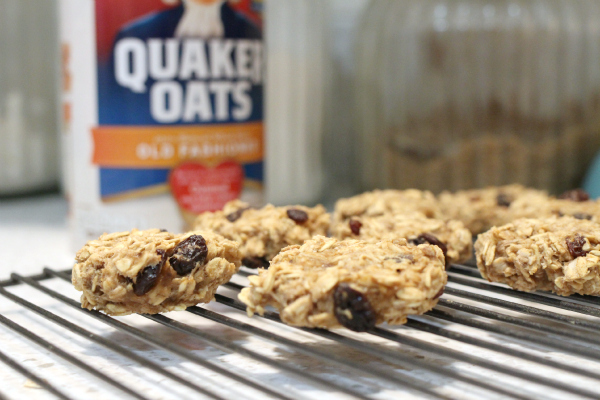 We will make this Quaker oats cookie this weekend. My 22 month old likes it with a dash of milk and brown sugar but still sticky so she can eat it with her hands in giant globs. My daughter and I are obsessed with warm oatmeal. Nothing else quite satisfies us. We love steel cut oats cooked in unsweetened vanilla almond milk and cinnamon and topped with mashed bananas. Perfection! My sons favourite way to eat oatmeal is in cookie form, unless my aunt makes it for him! He loves her hot oatmeal topped with my uncles maple syrup! He likes to eat a bowl of it with raisins and cinnamon. Though these oatmeal squares sound good. We will have to try them. We add a handful of oats to our smoothies. It thickens them up and makes them more filling. We also make oatmeal in the slow cooker overnight – yummy breakfast and the house smells delicious! My girls love to eat oatmeal for breakfast and love to put colorful sprinkles on them. They sometimes come up with some “interesting” colors. We made the most delicious Pumpkin Oatmeal Scotchies today. That may be the new favorite way to eat oatmeal. My almost 3 year old son loves having oatmeal for breakfast. He likes it with a hint of cinnamon and sliced bananas or strawberries. My daughter, Gabriela, loves hot oatmeal with homemade fruit purÃ©e mixed in. These cookies look super yummy and portable! We go running every morning so these cookies would be awesome for a snack afterwards. Can’t wait to try them! My 3 year old loves hot oatmeal in the morning with almond milk, peanut butter, and fruit! My kids/grandkids and I have been making homemade instant oatmeal in Mason jars with quick cooking oats, dried fruit and nuts. Yummy!! Three answers: cookies; cooked as a breakfast cereal with fruit; any which way so long as it’s a self-feeding project with plenty of sensory play. My ten year old loves to set up an oatmeal bar with all the fixings—-great oatmeal, nuts, dried fruit and brown sugar. My son like it with raisins, Cinnamon and a bit of maple syrup. My toddler can pack away 2 bowls of oatmeal in the morning, preferably with whole milk yogurt and raisins mixed in! He’s also not afraid to wear his oatmeal and yogurt (on his face, shirt, in his ear:) p.s. 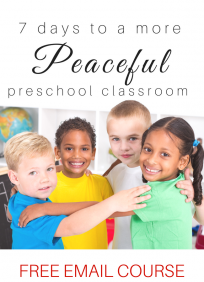 Love to use your site for inspiration for my toddler and preschooler, so thank you! My daughters love oatmeal with blueberries, butter, and maple syrup. My daughter likes oatmeal chocolate chip cookies and ice cream. Occasionally she will eat oatmeal in the morning if I’m having it and she wants to share mine, bUT isn’t much into hot cereals yet. She’s 5, so I figure I have plenty of time for that!! Thanks for the recipe and the great narrative!! With natural peanut butter and blue berries. Love making pumpkin spice granola with oatmeal at home and my kids at school love applesauce oatmeal cookies!! My kiddos love hot oatmeal with honey and raisins. My sons love oatmeal for breakfast wIth whatever berries are available! 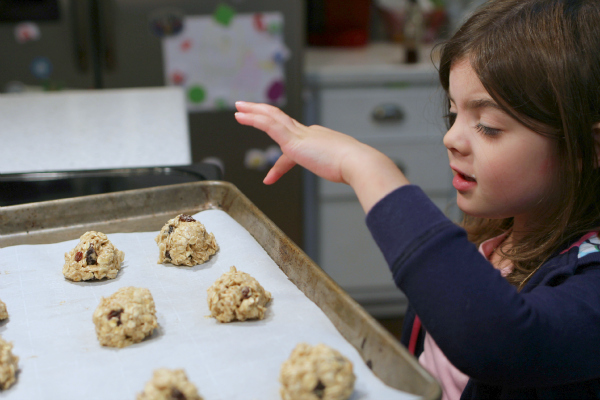 We love making oatmeal cookies too! Good lUck all. I love tHe bowl!! Mine love apple cinnamon oatmeal cooked overnight in the crockpot…Yum!! My stepdaughter used to love the Dinosauer Egg oatmeal but now that she’s getting to be a tween she likes fresh berries on her oatmeal. We love oatmeal! My 2 and 4 year old and I eat it daily for breakfast, with cinnamon, next to eggs and sometimes avocado, yummm! If daddy is home they like to eat it like him with a little syrup and brown sugar! We love oatmeal with brown sugar!! My kids really like it with raisins too! My twin boys LOVE to eat oatmeal. Their favorite way is an oatmeal muffin they help me make with plain yogurt, fruit (usually bananas), chia seeds, and some times (just for fun) raisins. The other favorite is a warm bowl of oats with blueberries and a dollop of plain Greek yogurt. We love to make oatmeal into granola with syrup,oil, and cinnamon. When it’s all baked we put yogurt in it and enjoy! My kids like oatmeal piping hot with cold milk on top! Our current favorite way to eat oatmeal is as baked pumpkin oatmeal. 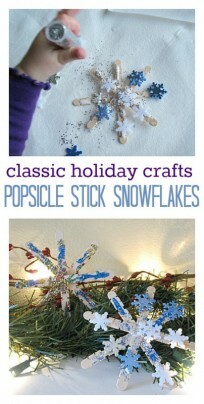 So great for this time of year! Honestly, my kids prefer oatmeal made into cookies. Haven’t won them over on it as breakfast yet. But the maple brown sugar is the flavor of MY childhood. Yum!! Brown sugar & butter, yum! My love for oatmeal is eternal- either instant for an on the go morning or with a sprinkle of brown sugar and milk on a lazy weekend morning. 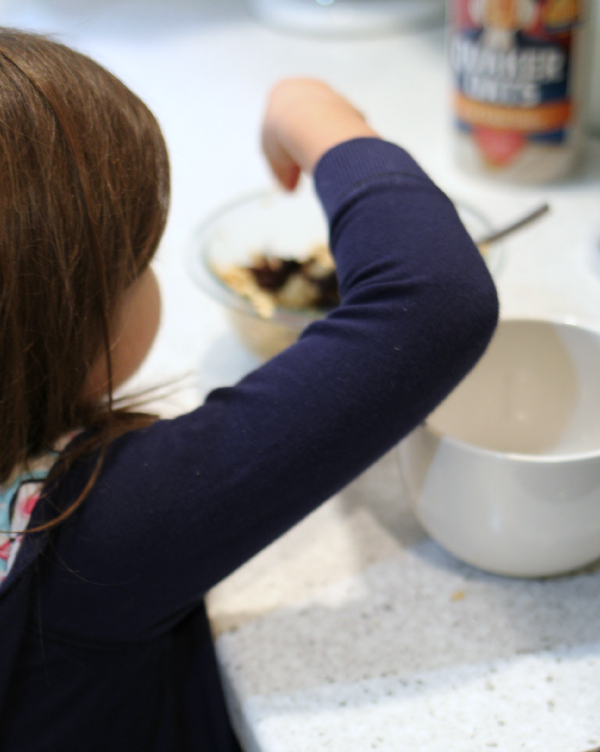 My kids are just beginning to appreciate oatmeal, and I am so happy to share this love! We love oatmeal with bananas over here!! My son loves oatmeal with raisins. Or maybe he just loves the raisins! Either way he gets the yummy goodness! My kids love their oatmeal served with coldmilk on top! With unsweetened vanilla almond milk, brown sugar, and a dash of cinnamon! They like to eat oatmeal with cinnamon and sugar mixed in. I don’t have a child. I like oatmeal with dark chocolate chips and strawberries and/or bananas. My family likes the fruit and oatmeal bars and the flavored instant oatmeal especially brown sugar. My kids prefer plain oatmeal with a jelly happy face on it. They think it’s fun and yummy. I love that it’s low in sugar and good for them! My five year old twins love to put fresh fruits of their choosing! They love to put chocolate or honey at times too! My son is a super picky eater but he does like oatmeal cookies! I’m hoping that if he tries oatmeal a few more times, and we try some different flavors, he will start to like it! He likes the little instant oatmeal packets. They’re easy to make and healthy.